The cuisine from the coastal town of Thalassery has travelled to Hyderabad. 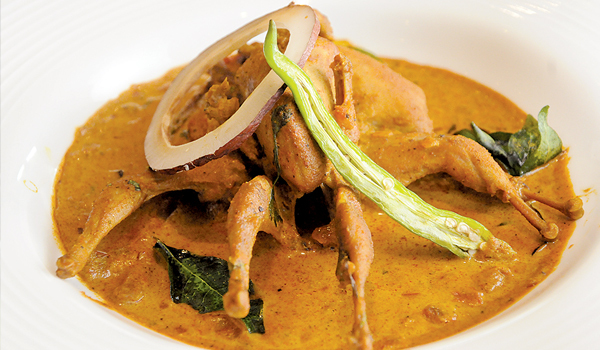 Head to Deccan Pavilion, ITC Kakatiya to sample the dishes from this beautiful town of Kerala. Chef Sumaija, who hails from North Kerala, has been invited by the luxury hotel to curate the Thalassery Food Festival. The dishes the chef served are from the Moplah part of the region. The food from the place is influenced by Arabs who sailed to the region. One doesna��t find the food loaded with spices that burn your tongue. Generous use of coconut, ghee and cashew-nuts give the same mild flavour which is light on the stomach. At the fest, we tried starters Turkey Pathiri, momos filled with minced mutton and boiled egg. The outer layer was crispy and tasted like home-made nimku. After all chef Sumaija learnt the culinary skills from her mother. We recommend Nayy Pathiri made with parboiled rice, coconut, fennel and shallots. The texture is grainy because the mixture is coarsely ground on stone tablet. It was crunchy enough that we thought it can made for a great tea snack. We liked the dessert best. We were served Kaipala Banana Cake which appeared like Turkish Delights filled with nuts. Revealed the chef, a�?We made this cake with egg yolks and sugar syrup. Ita��s often steamed and can be baked sometimes.a�?